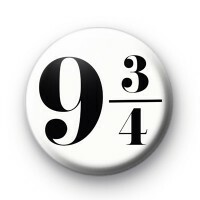 Platform 9 3/4 Badge in white with huge black Platform nine and three-quarters text in black. If you dream of going to kings cross train station to board the Hogwarts express all the way to Hogwarts, then you need one of these badges. Harry Potter inspired button badge. We have a range of potter inspired badges so be sure to have a look around the website & check out the movie badges section.